As I turned off the mountain road towards the nature reserve at Glaslyn I noticed that the verges surrounding the entrance to the track was full of parked vehicles. I began to wonder if maybe the car park next to the lake was full, although this would be unlikely in such a remote out of the way spot. 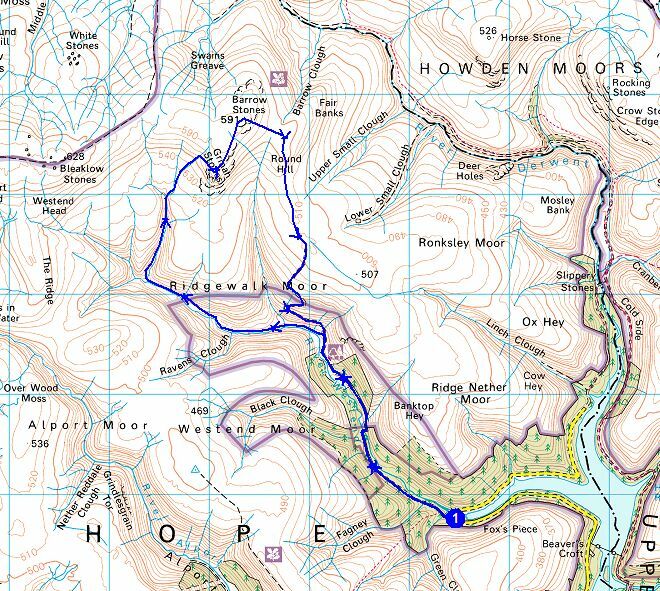 It is just under a mile of a rough pot holed track to the little car park and I received a couple of scowls from walkers as I rattled past them on the track. As usual the parking area was empty, a delightfully remote spot to start a walk and with the added bonus of being at 480 metres above sea level. 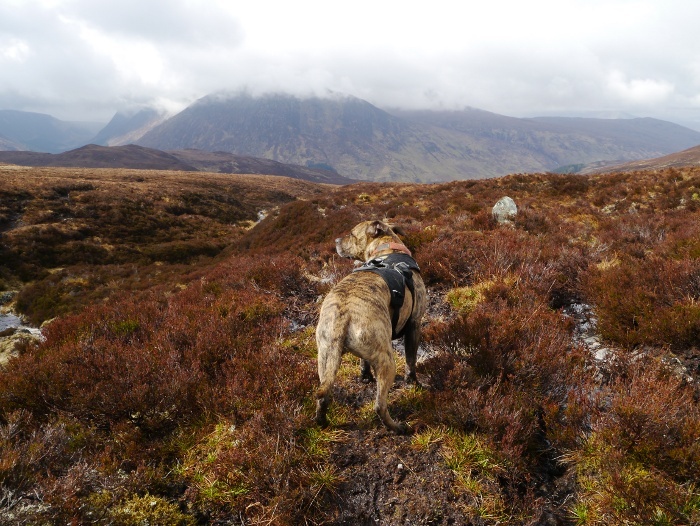 Reuben was happy to start the walk unencumbered by a lead as there were no sheep about. 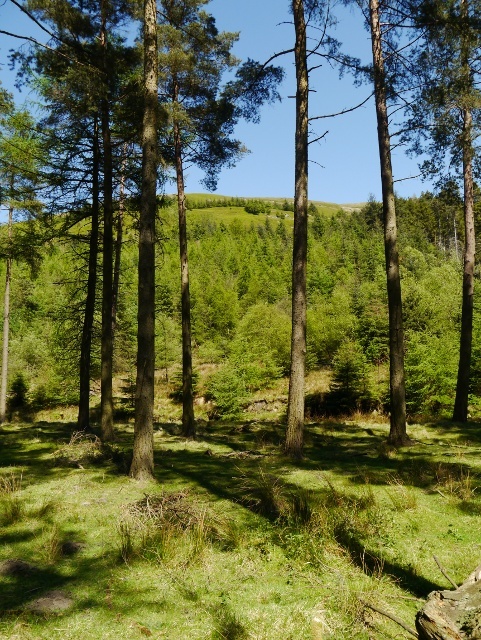 A firm track took us over a low ridge before descending towards the ruin of Bugeilyn, a sad melancholic spot even on a sunny day. Each time I pass, the remains of the building are in a further state of disrepair. 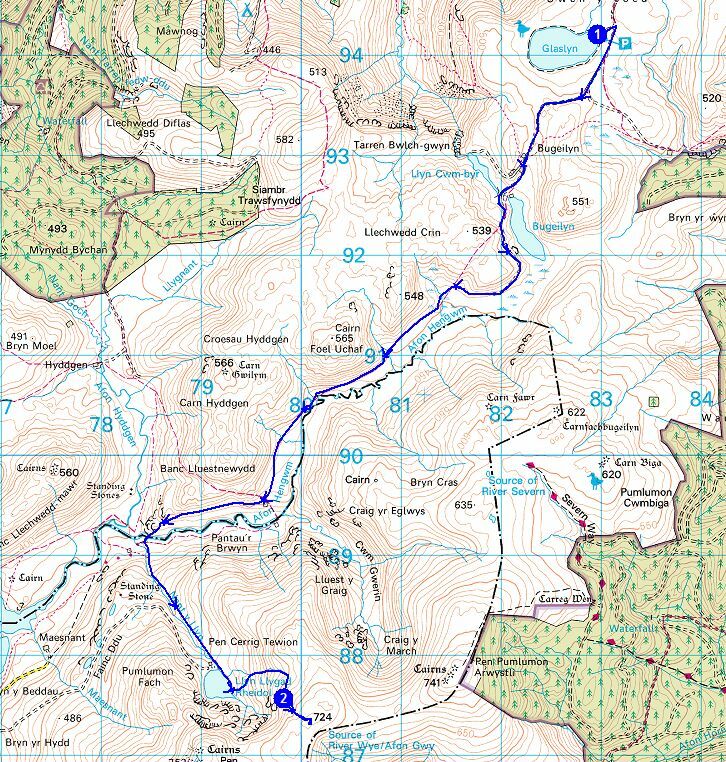 The track continued downhill and between the twin lakes of Bugeilyn and Lyn Cwm-byr, the track seemingly permanently waterlogged. A steady climb as the track contoured the hillside and I was rewarded by an excellent view of Cadair Idris framed by Lyn Cwm-byr, a fisherman casting a line on its bank. 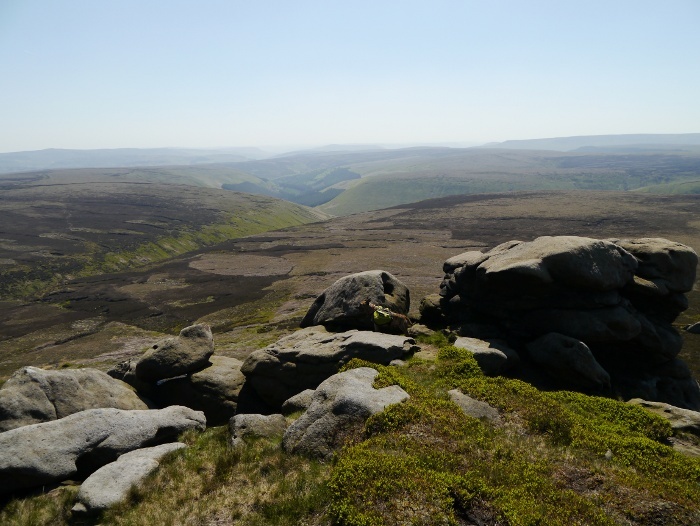 It was a perfect day to be on the hills, bright sunshine but with a cool wind to keep the temperatures down. 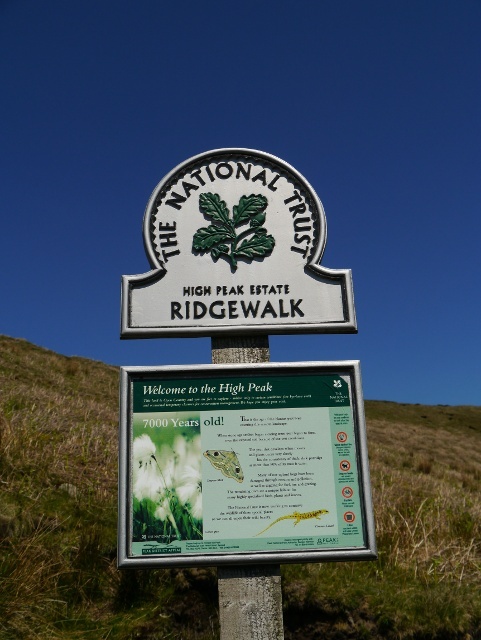 The air was full of birdsong and I realised that I have only visited these hills in good weather. I’m sure that their mood would change under low cloud and rain. 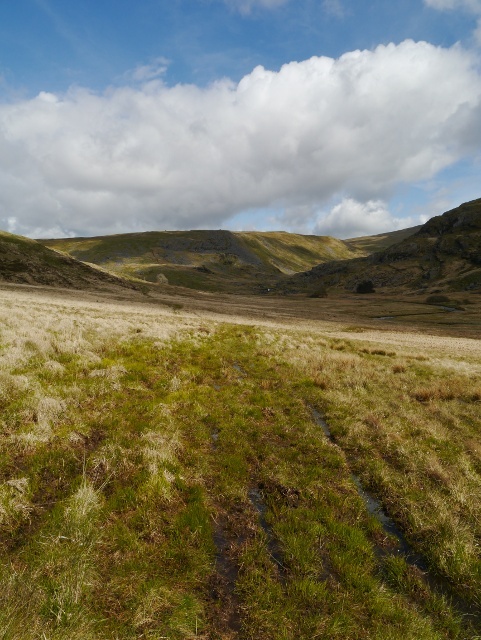 The track continued contouring the hill, above a wickedly evil looking bog at the head of Bugeilyn. From above it looks like it could swallow a person whole and I reminded myself never to attempt a crossing. The track came to an abrupt end, the way forward being a narrow grassy path. 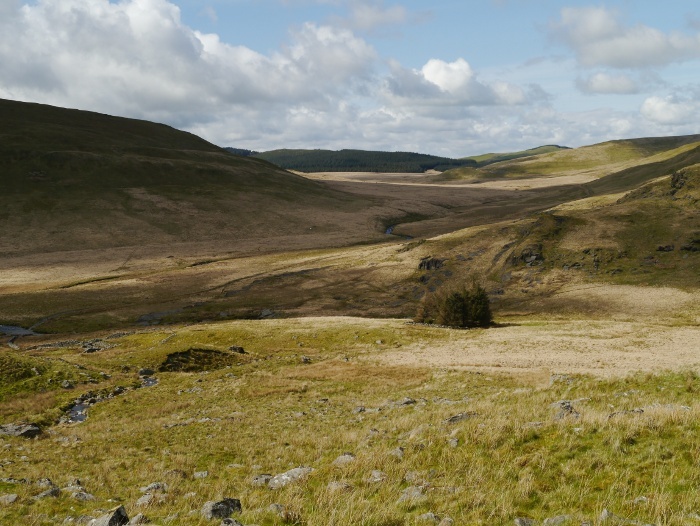 We were now in a high grassy bowl in the hills, the headwaters of the Afon Hengwm, my favourite valley in Wales. We followed the narrow path down the valley for a kilometre until we came to a stream surrounded by boulders. One of these provided a perfect seat so I took the opportunity to relax and make lunch and a coffee. Sheltered from the wind it was great to feel the warmth of the sun, possibly for the first time this year whilst backpacking. One of the joys of backpacking is being able to take your time, stopping and soaking up the atmosphere of a remote location. As I was packing up the only people who I would see all day passed by, Reuben greeting them like long lost friends. A quick chat and I was alone once again as I followed the sketchy path down the valley. 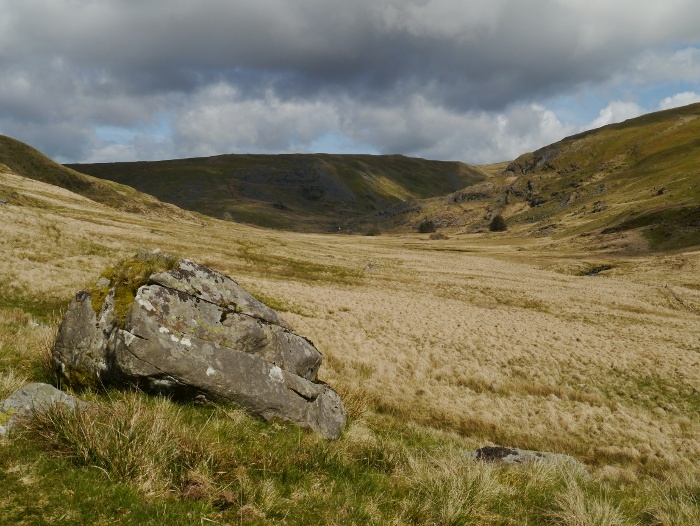 The entrance to Cwm Gwerin began to reveal itself across the valley, the rock formations catching my eye. I would imagine that some serious geology created the fantastic patterns on the hillside. I have passed Cwm Gwerin several times now whilst walking along the Afon Hengwm but have never ventured into its lonely corners. 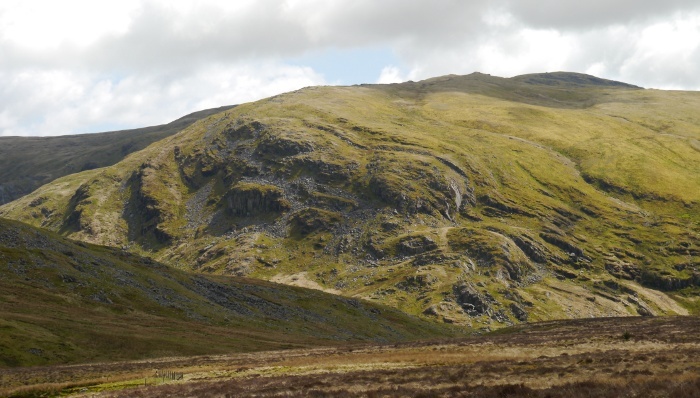 A tumbling burn flows from its entrance, framed by rocky slopes which are rare in Mid Wales. 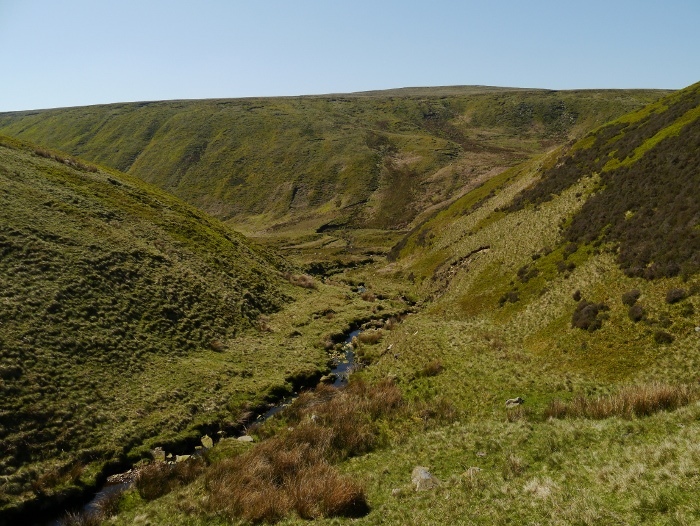 I must return one day and wild camp within the hidden depths at the head of the valley. 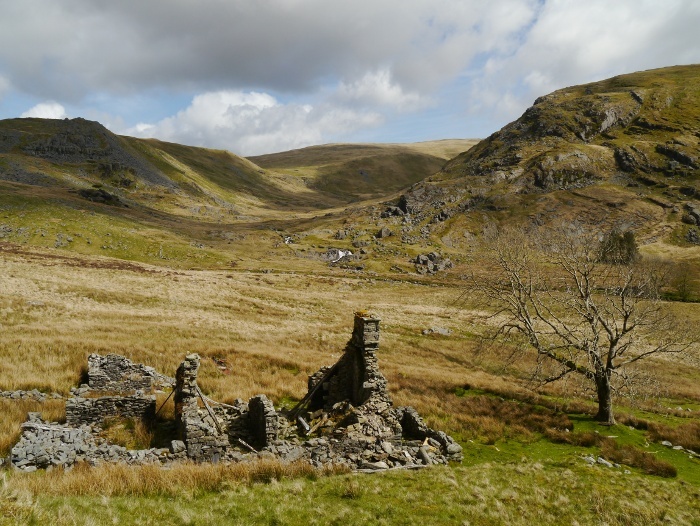 We passed another ruin, this time perfectly situated to take in possibly the best view in Wales, remote and secluded. Rebuilt it would make a fantastic weekend retreat, although it must have been a hard life for its original inhabitants. Passing the ruin the path began to deteriorate into a wide marshy track. I sloshed along, water up to my ankles after deciding it useless to attempt to find a dry passage. It was hard going, only the views and warm sun keeping the smile on my face. The path met the rocky prow of Banc Lluestnewydd before descending towards the footbridge over the Hengwm. Passing a small stand of wind blown pine within an enclosure we took the right of way alongside the Nant y Llyn, almost invisible on the ground. 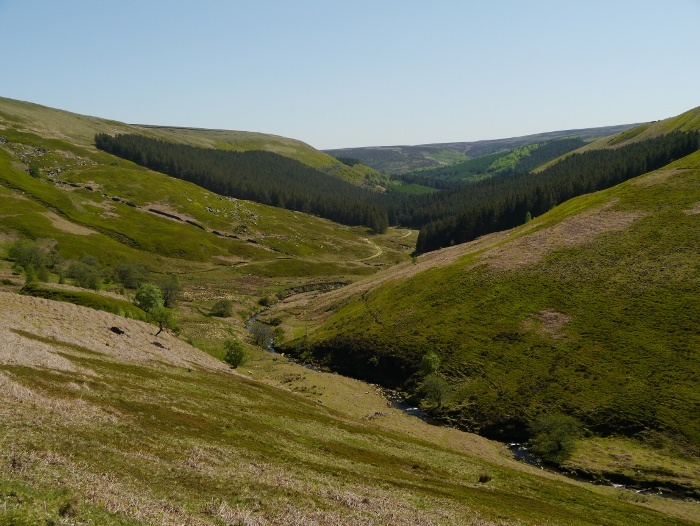 As height was gained the views opened out to another favorite wild valley, the Hyddgen. 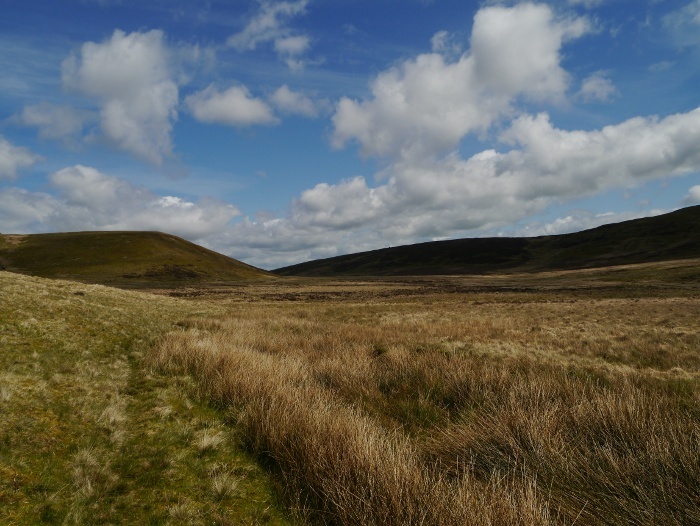 This is thought to be the site of Owain Glyndwr’s 1401 Battle of Hyddgen, today it is on the front line in the battle against the industrialisation of the Welsh uplands. 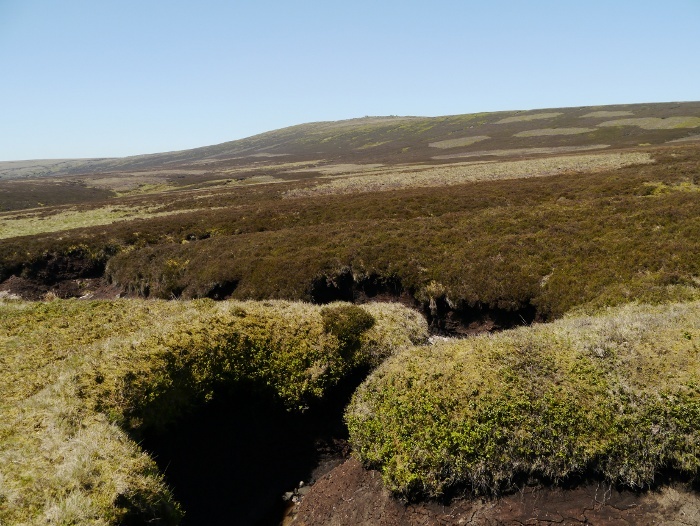 As height was gained the ground deteriorated once again as it became a huge soggy mattress of sphagnum. 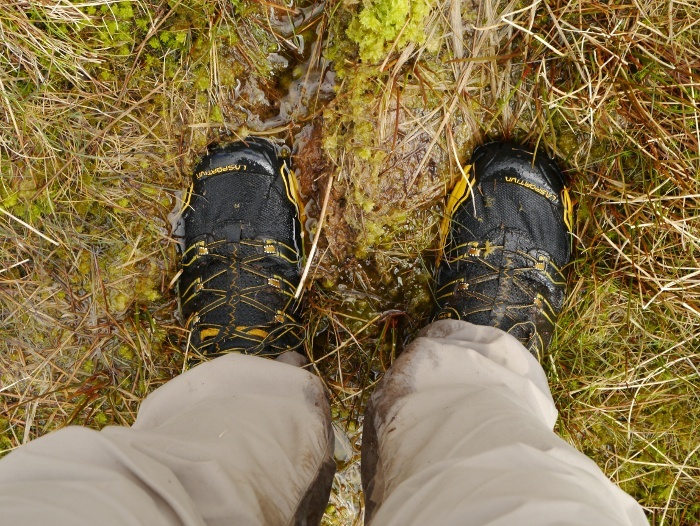 It was ideal for unlined trail shoes as lined boots would soon be defeated in these sort of conditions. It was almost pleasant to feel the rush of cold water flood in with every step. Without gaiters I was pretty damp from the knees down, although hardly as issue in warm and dry conditions. 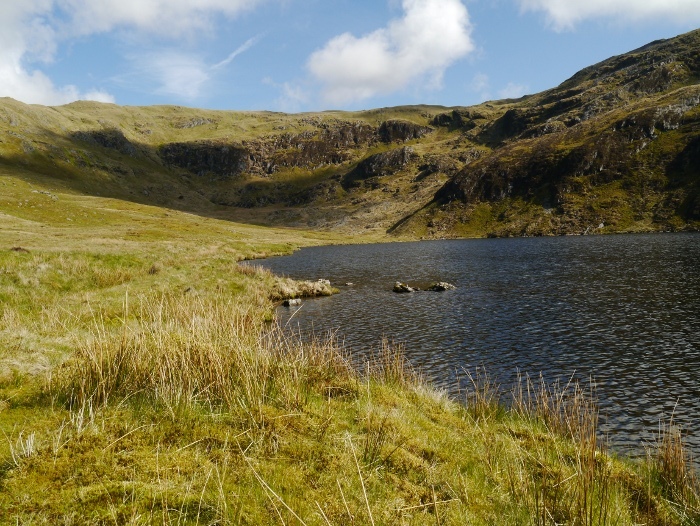 We were soon at Llyn Llygad Rheidol, nestled in a bowl ringed with vegetated crags beneath the summit of Pumlumon Fawr. 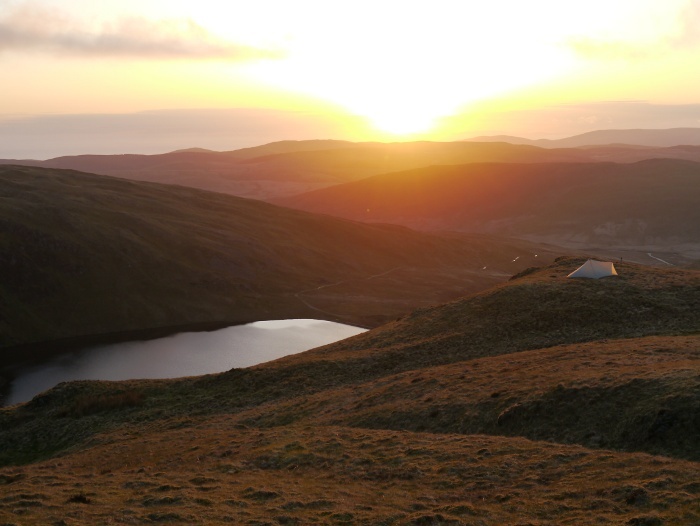 We passed an idyllic looking camping spot next to the lake but I had plans to camp on the summit. 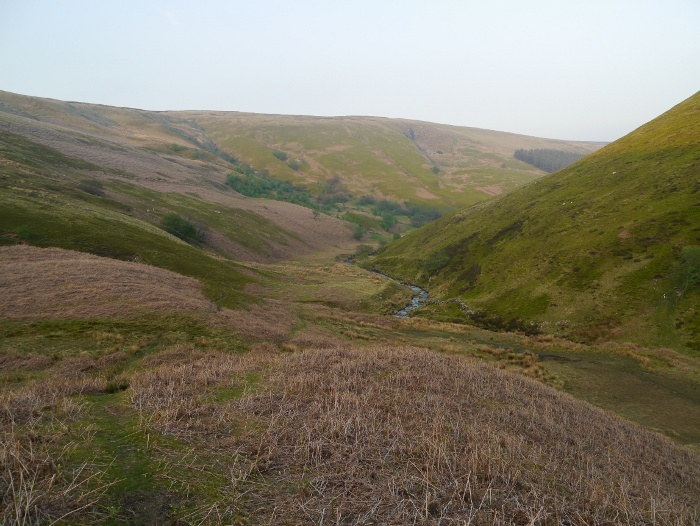 The idea was to climb up alongside one of the streams at the head of the Cwm, taking water from the highest point and carrying it to the summit. However through my binoculars it was evident that they were at best a tiny trickle. Instead we followed the fast flowing stream to the east of the lake, climbing easy grassy slopes. This flowed cold and clear right up to the 650 metre contour where I collected a few litres. Fully laden it was a slow walk towards the summit and I soon persuaded myself to stop on a flat grassy ledge with stunning views down to Llyn Llygad Rheidol. It was fairly breezy on the ledge at 670 metres and I guessed that it would be even windier right on the summit of 752 metres. 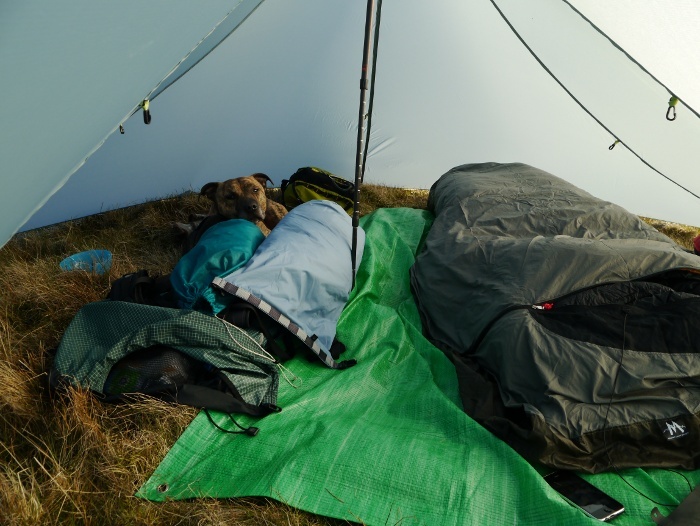 As I started pitching the Trailstar Reuben took himself off and made a nest in the grass, within minutes I could hear the sound of him snoring. With gear sorted I fancied a stroll above camp before getting comfortable for the night. 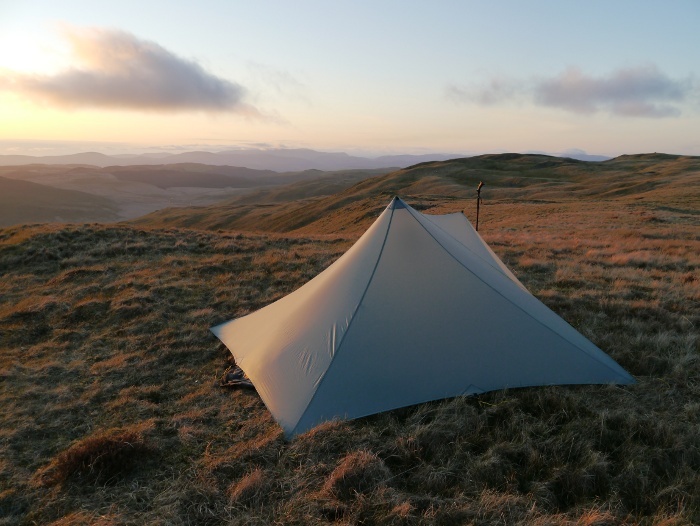 A short walk up the hill gave stunning views over camp, my Trailstar becoming a small spec amongst the hills rolling off towards the horizon. With energy to spare I continued upwards, Reuben racing around unencumbered by his pack. 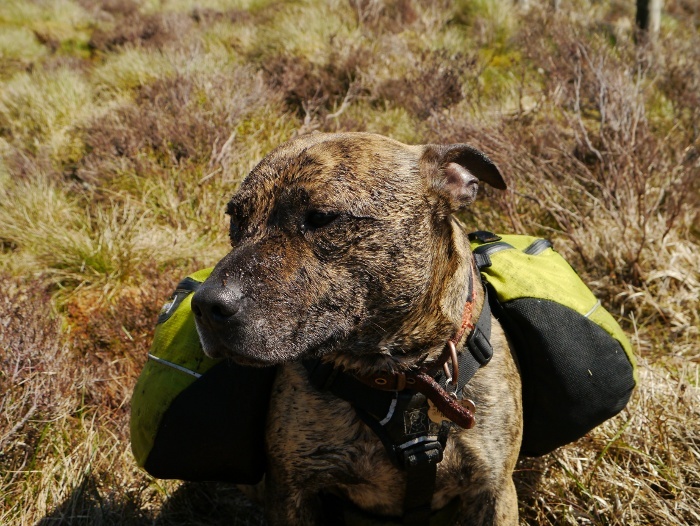 I knew how he felt as I was also climbing with ease, my pack now safely stored in the Trailstar. 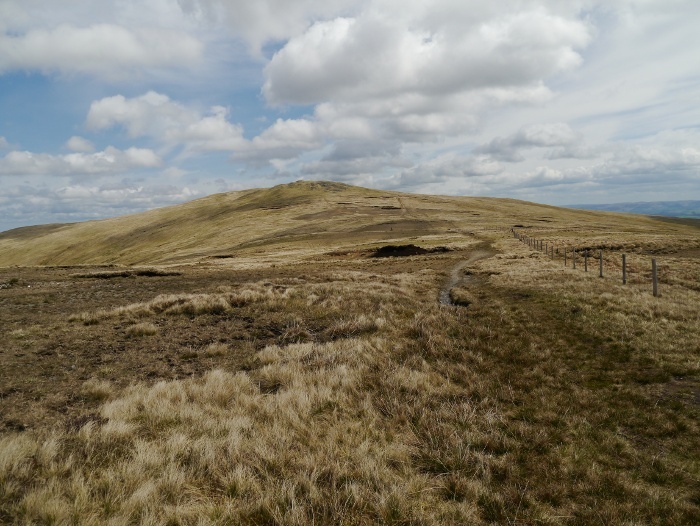 As I reached the ridge the views opened up across to the Brecon Beacons, with the moors surrounding the Elan valley providing a high plateau in the middle. To the north I could see the peaks of Snowdonia with Cadair Idris and the Arans being most prominent. 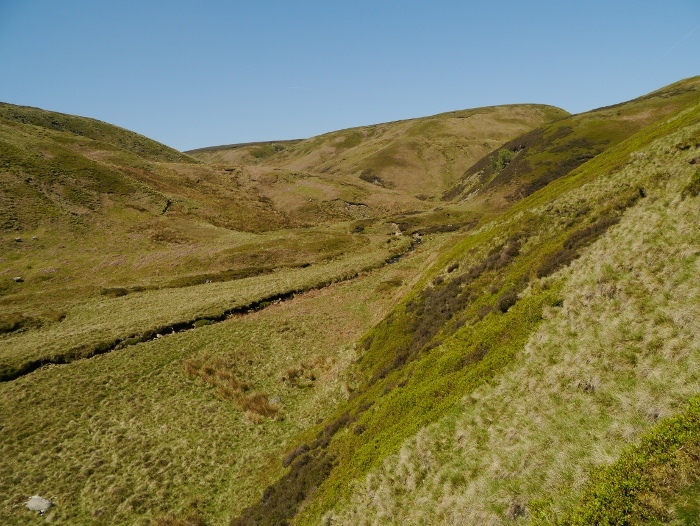 The Berwyn hills rose proud above the extensive moors to the east. Unfortunately the Cefn Croes windfarm was very prominent to the south, the huge spinning blades casting shadows due to the low angle of the sun. The following morning from the summit of Pumlumon I counted eight such wind farms on the surrounding hills. The feeling of being in a wild place that I had in the depths of the Hengwm suddenly diminished. 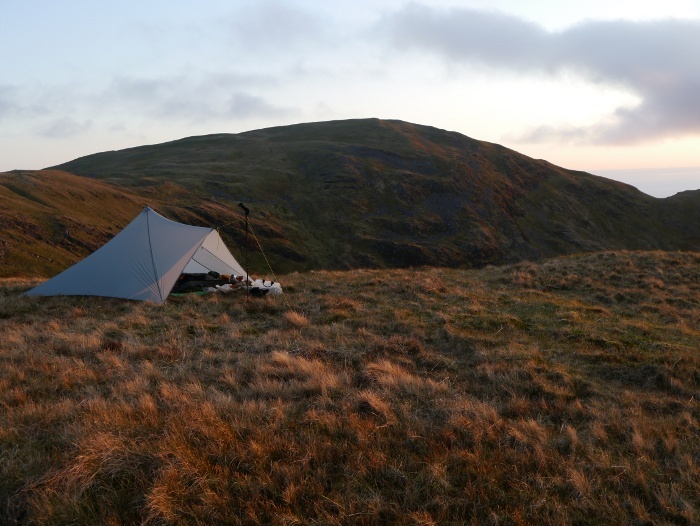 Back in the Trailstar I relished taking off my wet socks, my feet steaming in the cold air. As I cooked dinner the breeze totally dropped and the temperature started to plummet, ignoring the fact that it was now the middle of May. After dinner I noticed the change in light, the surrounding hills taking on a pinkish hue. Wrapped deep in my down jacket I was soon out, savouring the slow descent of the sun and the free light show that it provided. The hills took on a magical velvety texture, soft outlines against the orange of the sky, rolling off towards the sea sparkling on the western horizon. I stood there for ages and when the sun finally vanished I rushed back to the shelter to make a hot drink. I then climbed into my sleeping bag whilst still wearing the down jacket. An hour of reading my kindle soon had me asleep. 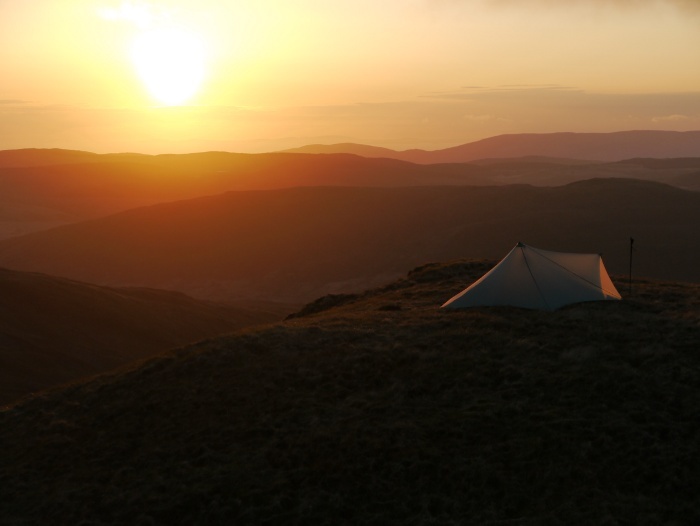 I woke in the night with the sensation of wind blowing across my face through the open side of the Trailstar. 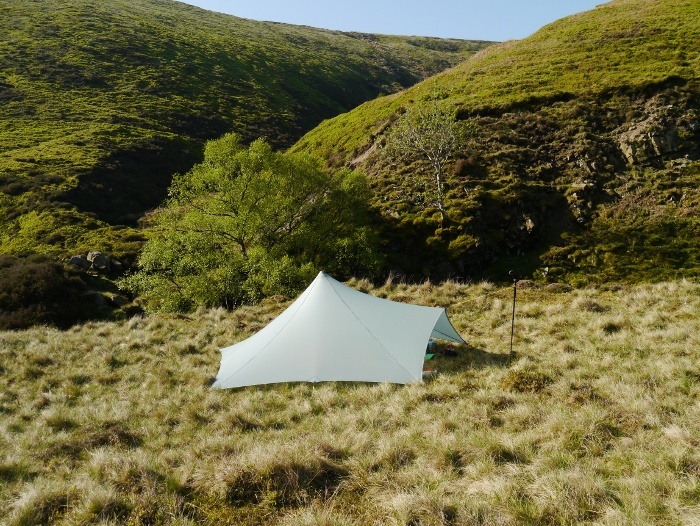 I had pitched the shelter high at 120cm and it was now flapping in the wind, but I could not be bothered to get up to lower it. My alarm woke me at 7.00am and I was greeted by a dank and misty morning, the sound of wind shaking nylon. I could not be bothered to get up in the murk so went back to sleep, condensation that had formed on the seams of the shelter being shaken onto my face. I periodically peered out from the warmth of my sleeping bag, finally emerging when I spotted blue sky through ragged cloud which was being torn apart by the wind. Within the space of ten minutes the cloud disappeared, being replaced by a hazy blue sky. 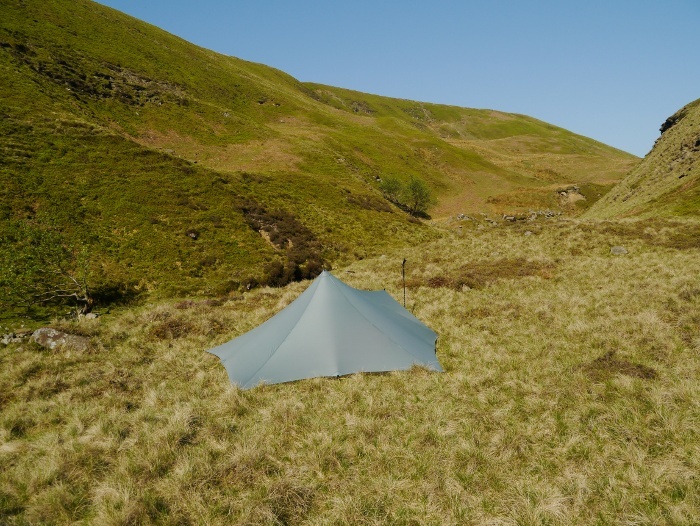 Sheltered from the wind it became pleasantly warm in the Trailstar and I procrastinated whilst eating breakfast. 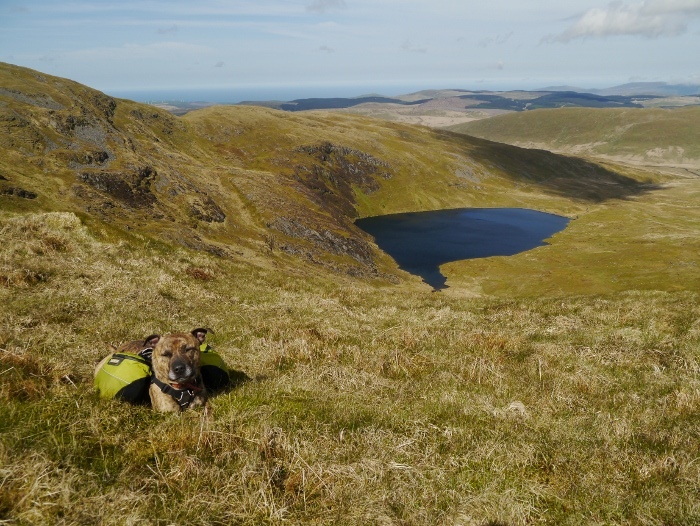 Finally I was packed and we were on our way, contouring above Llyn Llygad Rheidol. 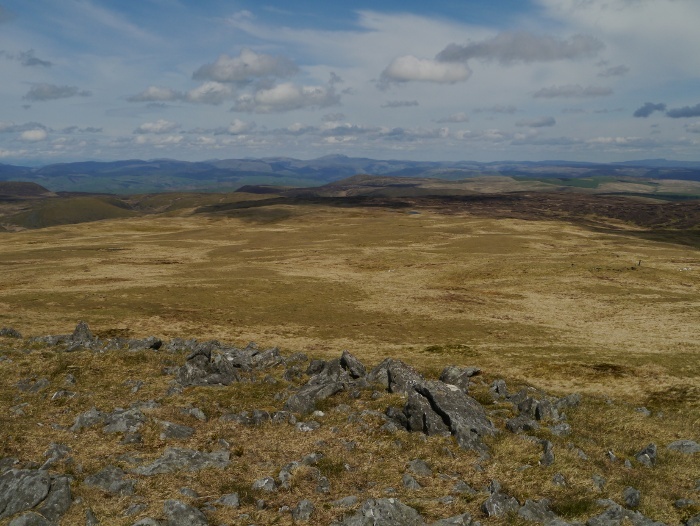 The wind was strong on the summit of Pumlumon Fawr and I was glad that I had not pitched there. 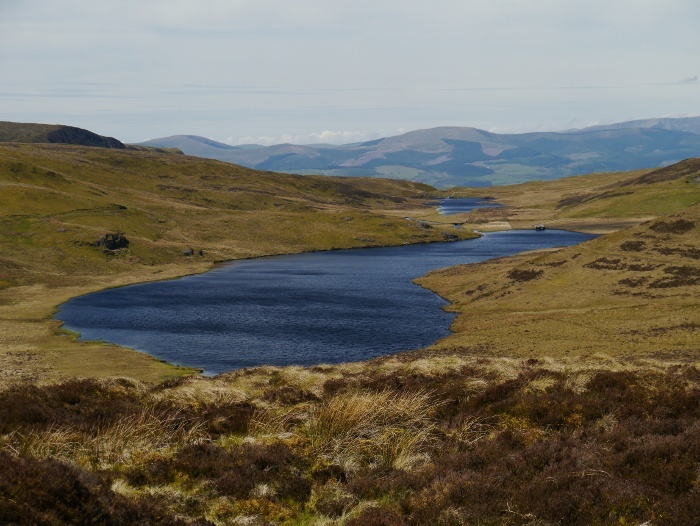 The views were extensive, the long winding shores of the Nant-y-moch reservoir catching my eye. We wandered to the cairn situated north of the trig point, a worthy detour for the extensive views down the wild uninhabited Hengwm and with the Arans in the distance. The strengthening wind meant that it was not a place to linger so we set back off the way we had come, picking up a broad track running parallel to the fence. 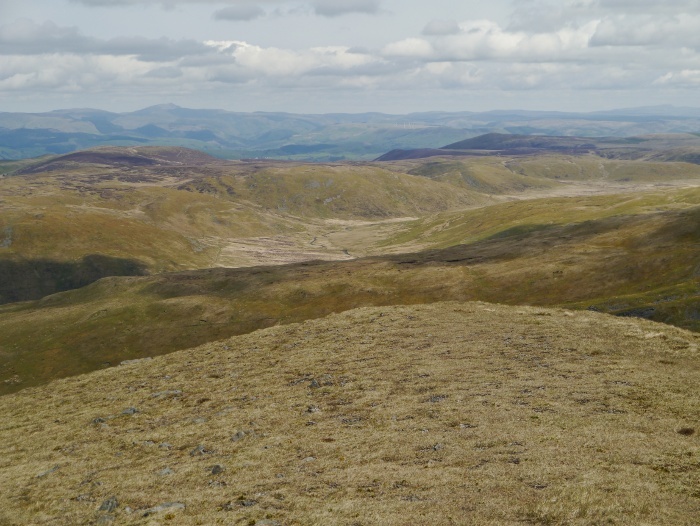 The going was easy over a minor summit, the firm path leading to Pen Pumlumon Arwystli. 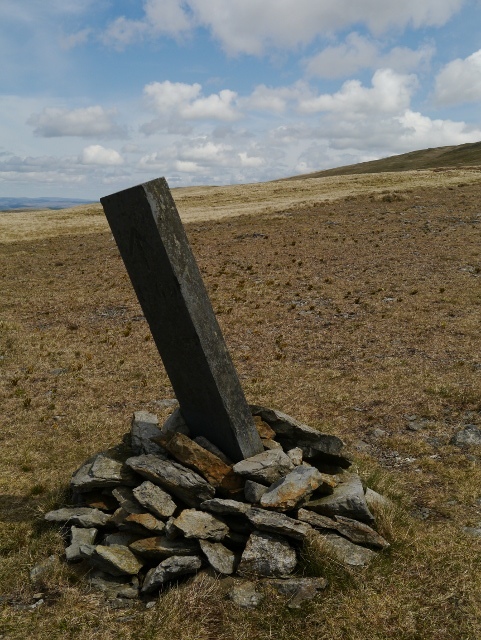 All along the ridge are these slate markers engraved with an arrow. I’m really not sure of their purpose as some of them point in rather random directions. 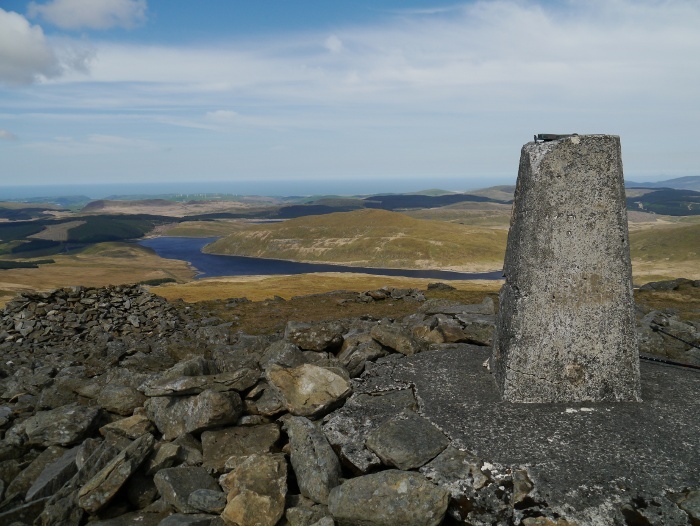 Perhaps there is a waymarked route to the summit of Pumlumon? The triple cairned summit of Pen Pumlumon Arwystli was easily reached, once again providing excellent uninterrupted views in all directions. 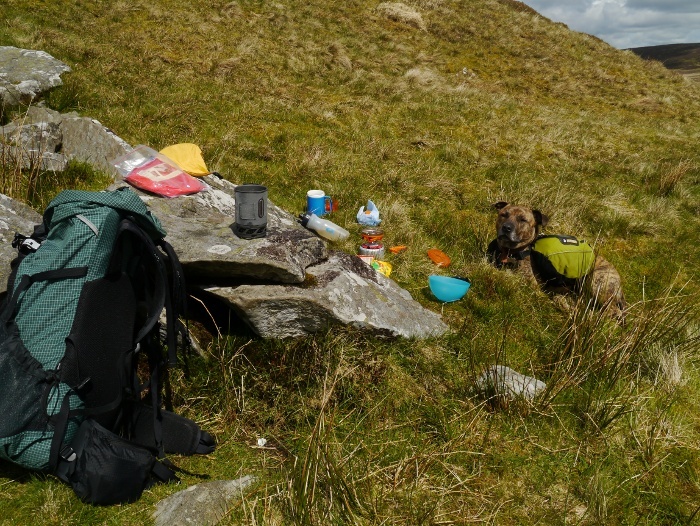 One of the huge cairns provided shelter from the now strong wind whilst I had a quick snack. Heading north the way forward was across a large grassy plateau, easy going in these clear dry conditions. 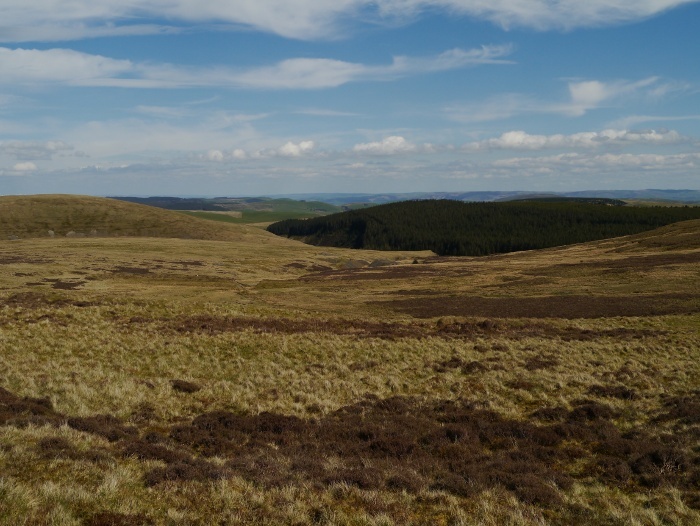 The nature of the terrain changed abruptly as we got close to the source of the River Severn, cropped grass being replaced by deep heather and peat bog. 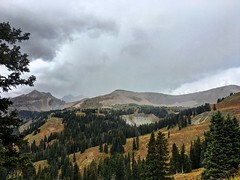 It was soon squelching time again across the sodden ground, with detours to avoid the wettest sections. 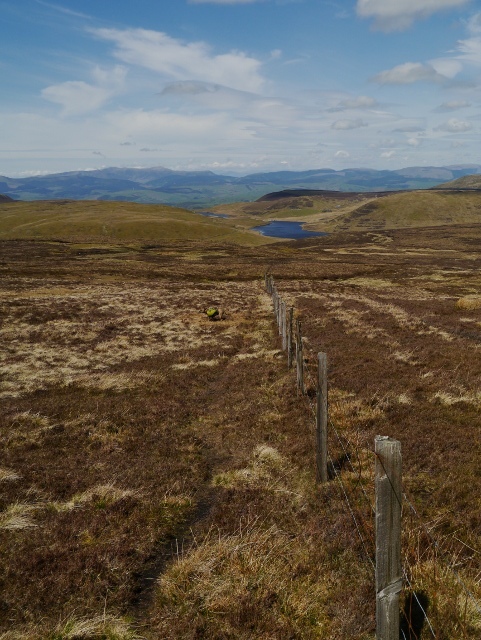 A section of fence had been replaced, the landowner not a follower of the ‘leave no trace’ principle. 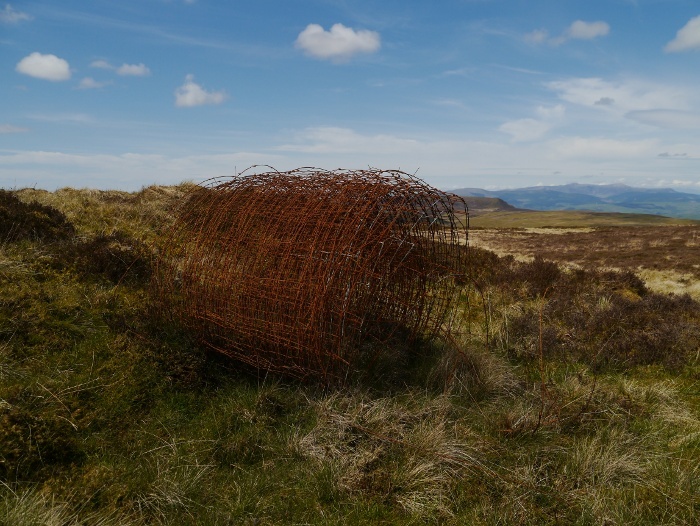 The fence was followed to Carnfachbugeilyn and then due north through a feint groove in the heather. The vague path soon vanished and the lower we got the tougher the going. Rough tussocky ground was covered in deep heather and numerous holes and it was a case of lurch forward rather than walk. With the strong wind buffeting me I started to get annoyed and progress was painfully slow. The view across Llyn Bugeilyn almost made up for the suffering though. We had crossed numerous fences during the two days. 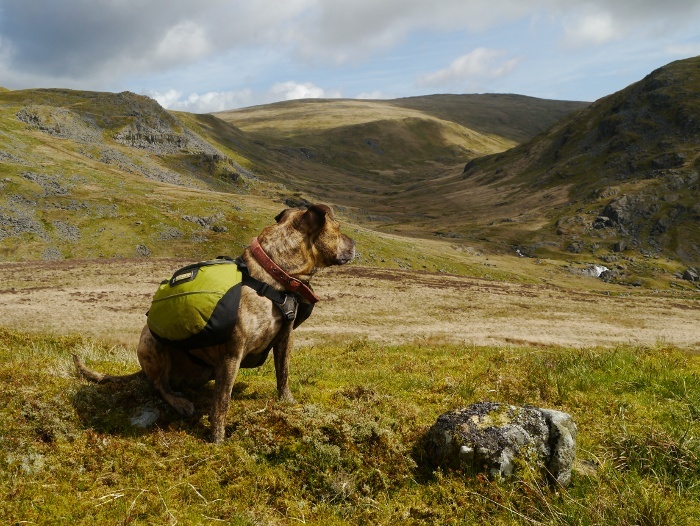 The technique for getting Reuben across is to lift him by the handle on the top of his pack whilst placing a hand under his belly. A swinging momentum then gets him easily over low fences. On the final fence I swung him over as usual and the momentum meant that he continued running forward. Unfortunately for him a drainage ditch was in the way and he entered it head first, his pack firmly wedging him in. With just his back legs sticking out it was a sorry sight and I dashed over the fence to retrieve him. Thankfully no damage was done except to his pride, although he was covered in a large amount of dripping stagnant peat. He got his own back by shaking it off all over me though. The rough wet stuff continued right up to the steep grassy slopes of the small hill called Bugeilyn. Crossing the summit my Kestrel device measured winds of 35mph. Descending the other side a peat hag provided shelter from the wind so we sat in the sun whilst I cooked a pasta lunch. Thankfully I could see the car glinting off in the distance, although I was in no rush to return to it. 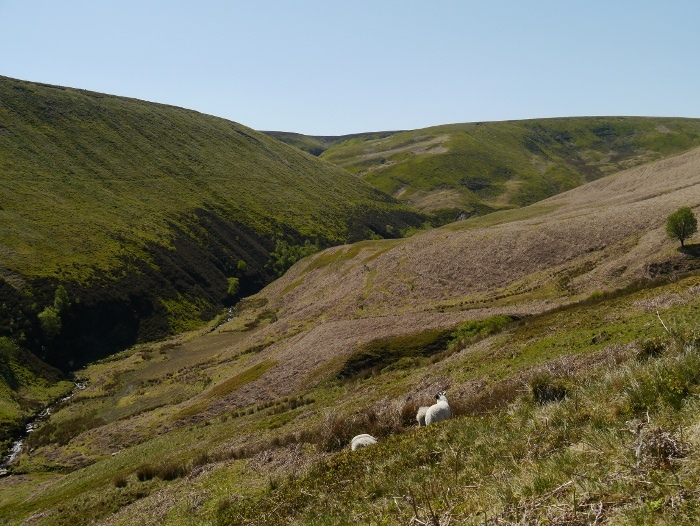 A series of sheep paths gave good easy passage as we contoured around the head of Afon Clywedog, which flows into the large reservoir of the same name. A quick walk along the surfaced track and we were back at the car. Two fantastic days of solitude on a very underrated hill. During the previous evening I shot a small amount of video of the high level camp. The usual mix of barely audible mumbling and shaky camera work can be viewed below. 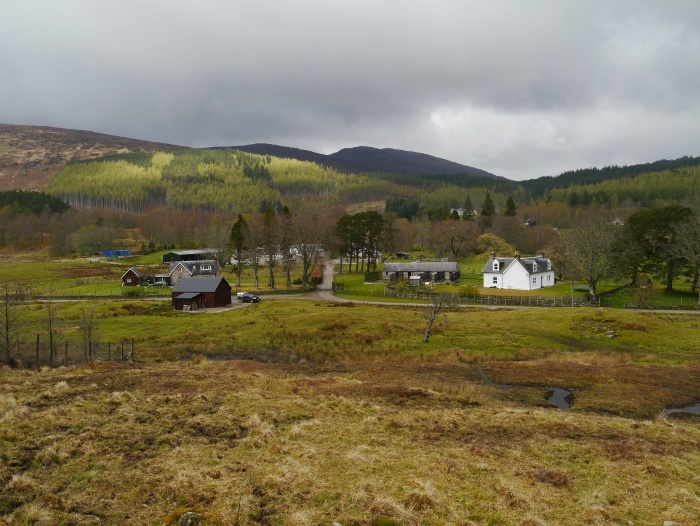 My luck with the weather finally expired on our last day in Strathconon. 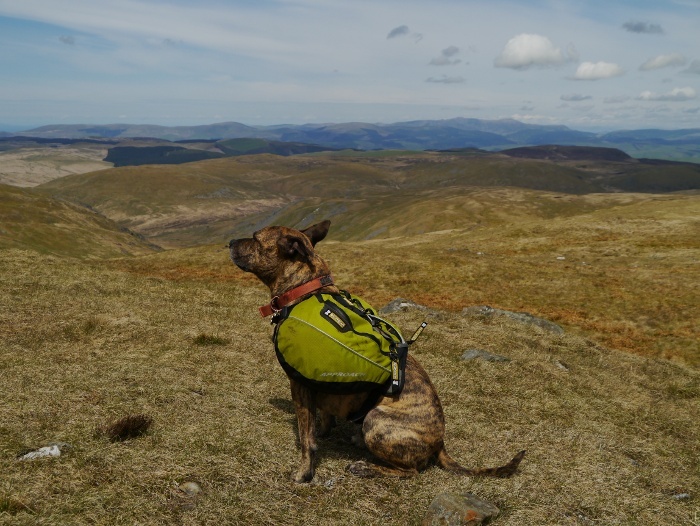 Corrina elected once more to stay at the cottage whilst I headed out with Reuben down the glen under leaden skies. As we pulled up outside the empty chapel, rain was being blown across the glen on an increasing breeze. The chapel itself is up for sale and would make a brilliant place to live if it could be converted. Details here and it is a steal at £90,000. I had read that the bridge over the river Meig at this point is often locked. I pulled on a full set of waterproofs and walked over to have a look. There is a gate at one end of the bridge and I noticed a padlock, although thankfully on this occasion it was unlocked. 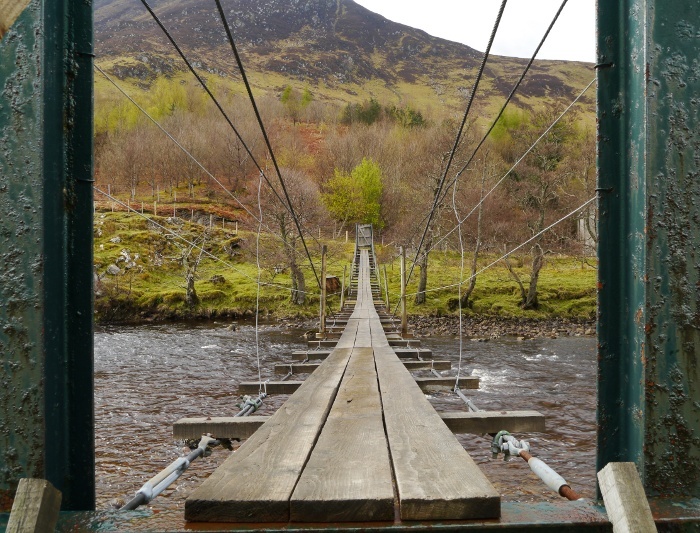 I went back to get Reuben and set off across the rather long and wobbly suspension bridge. It is only three planks of wood wide and it sways about as you cross. I turned around and noticed that Reuben had frozen after only a couple of metres. It took a bit of coaxing to get him across, with legs splayed and belly close to the wooden planks. 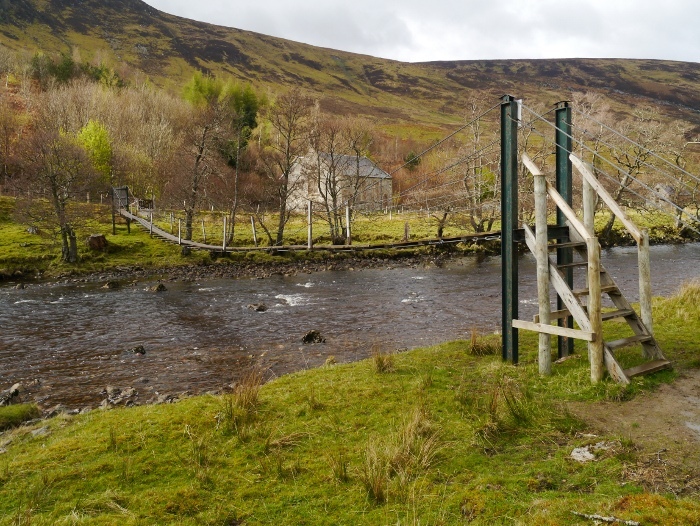 Once across it was easy walking along a wide vehicle track to the small hamlet that surrounds Dalbreac lodge. 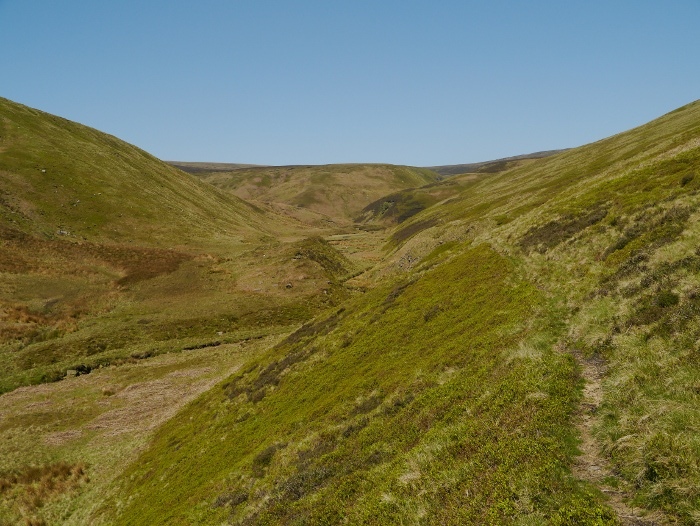 We followed another track that branched off to the right and slowly began to climb across open moorland. There were huge numbers of deer here, standing as still as statues watching our every move. Then suddenly in unison they all turned tail, running across the hill until out of sight. 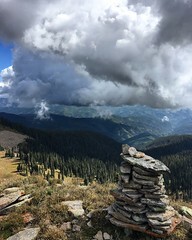 There was a permanence to the clouds as I put my head down and started the long climb, the path marked on my map actually being a track. 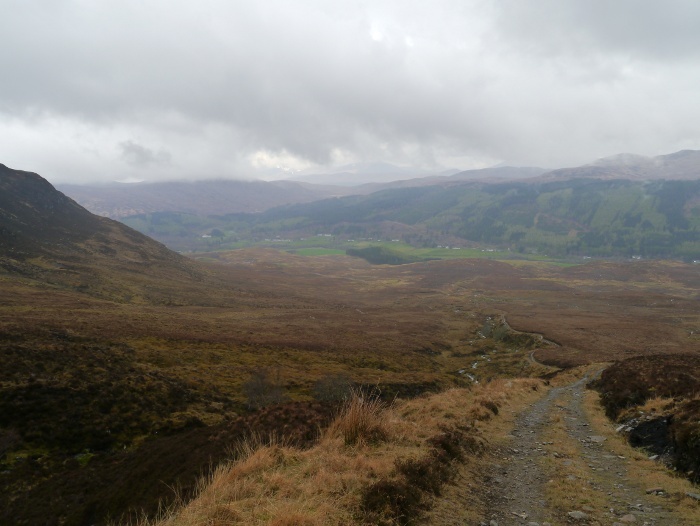 The views back down the glen were not as inviting as they had been on previous days. 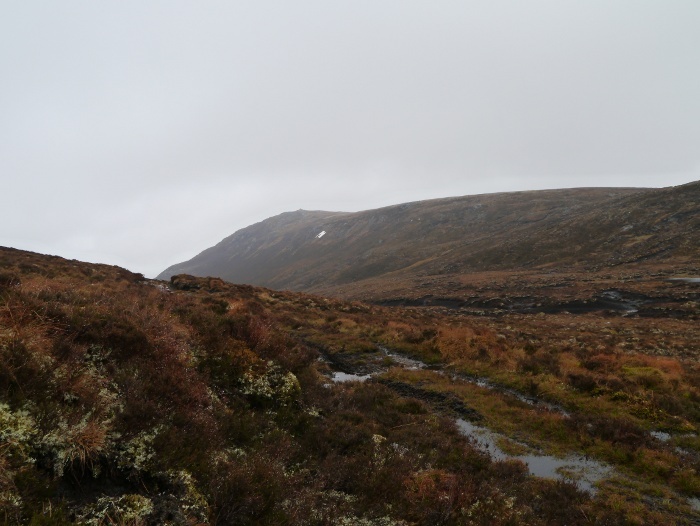 The track levelled out on the 600 metre contour amid a sombre landscape of deep heather, black peat bogs and grey rock. I could see the summit of Carn na Coinnich across some wet and formidable looking peat hags, mist teasing the summit. 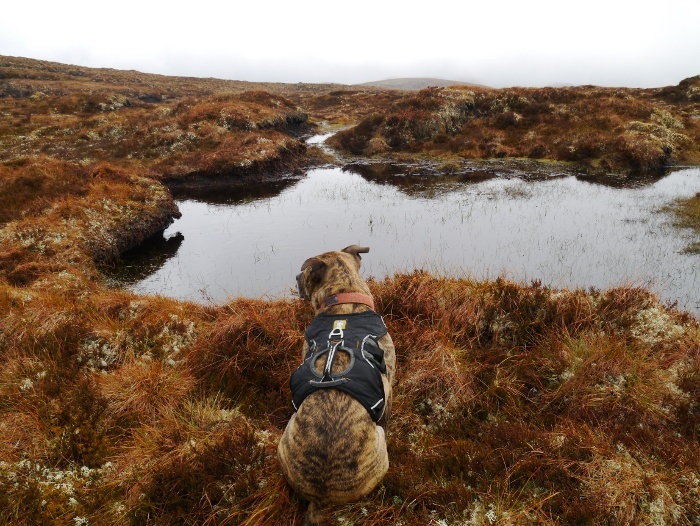 I made a nest with Reuben among the wet heather to eat lunch just as wet snow flakes started to appear out of the leaden sky. Lunch did not last very long as we were both soon cold and shivering. The peat hags were crossed, not being as bad as they first looked. With firmer ground reached it was a short sharp climb up the hill. 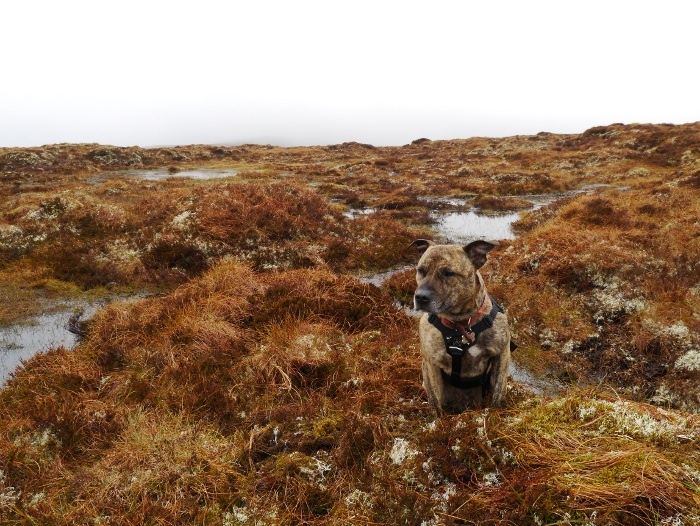 North of the summit was a terrible mess of tussocks and boggy pools. With the mist drifting in front of us on a cold keen wind I don’t think I have ever visited somewhere so desolate. 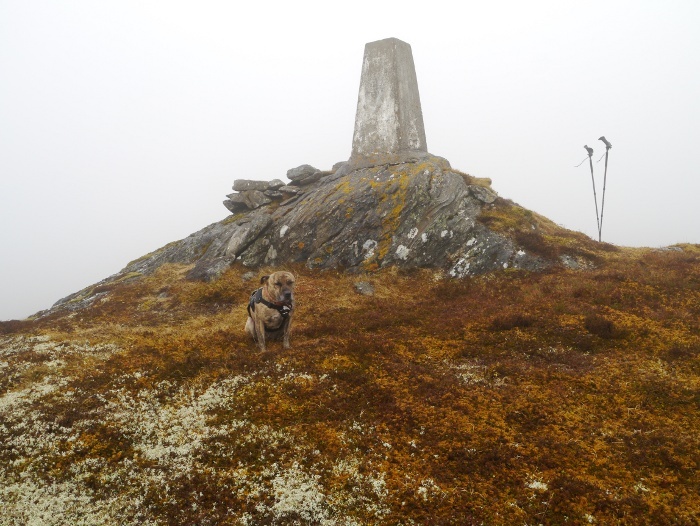 The summit itself was easy to find, the trig point being located on a small rocky outcrop. It was not a place to linger with the damp air beginning to take its toll on my waterproofs. 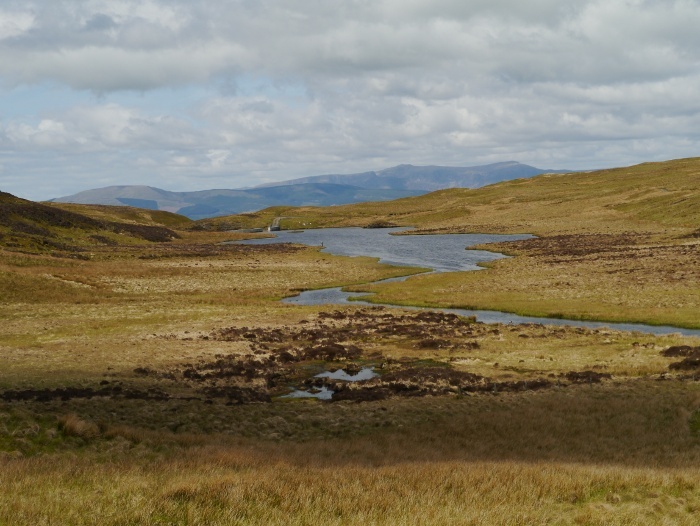 The plan was to aim for Loch Gruamach, inconveniently located on a separate OS Explorer map. This made navigating awkward in the mist and I was glad of a brief parting of the clouds which enabled me to confirm that I was on track. 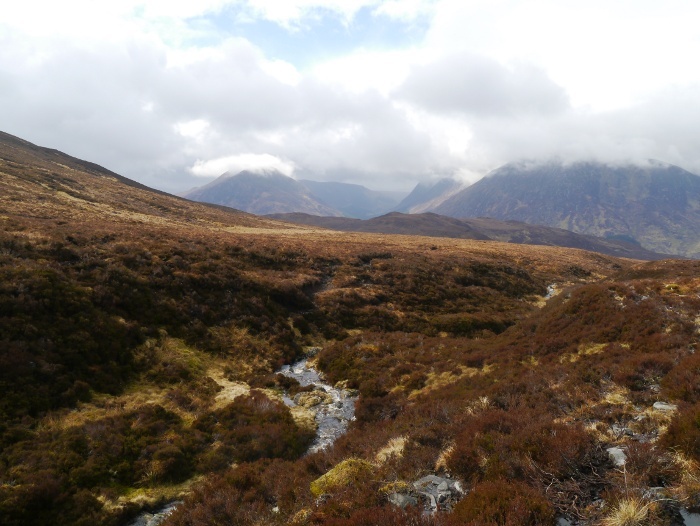 The walking along the shores of the loch was slow and torturous through oozing black peat hags, wind blowing curtains of mist across the water. 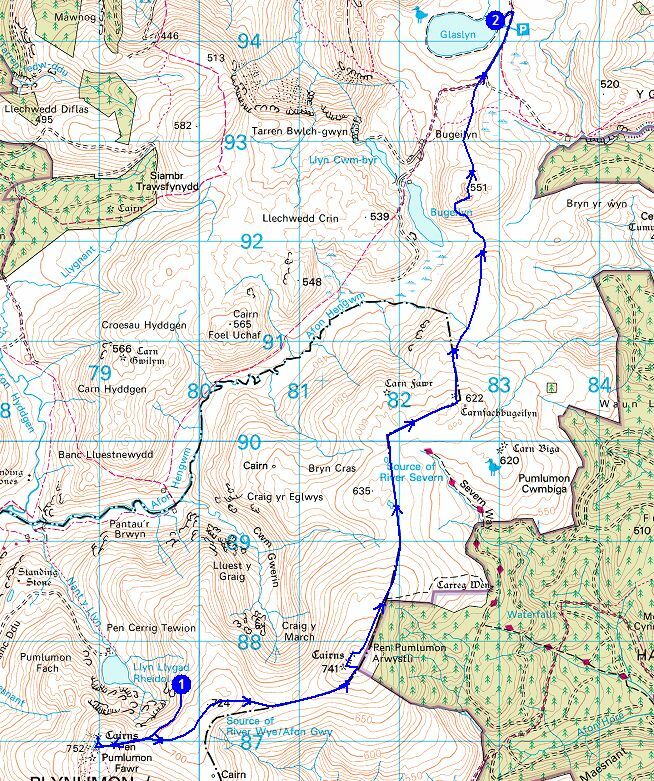 I was thankful when we crested a low ridge and began the descent down rough slopes towards a path marked on the map. Unfortunately the path did not exist and we crossed swampy ground to get near the infant stream. Following the right bank a series of deer trails were picked up, easing progress through the deep heather. Thankfully the sky brightened for a while revealing the hills on the other side of Strathconon, lifting my mood which had began to stagnate. 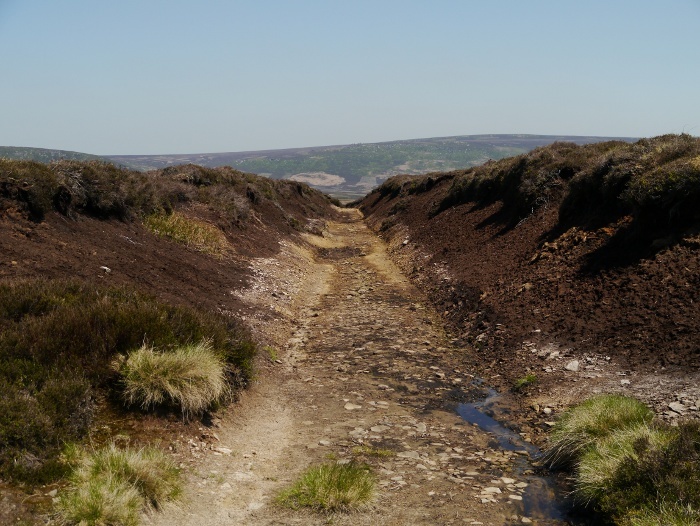 The deer trails through the heather came and went, either being swallowed up in the bogs or branching off up the hillside. 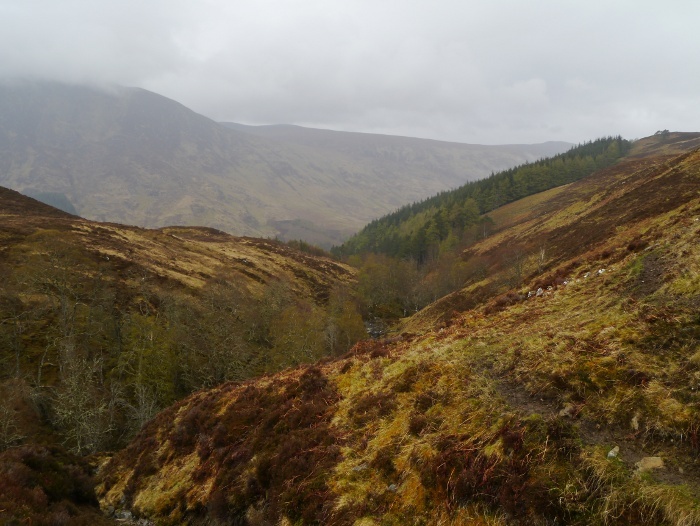 I spotted a cairn down steep slopes toward the river and set off hoping it was marking a path. It did not and I cursed to myself as I now could not be bothered to climb back up the hill. Instead we followed a feint animal track across the steep hillside, high above the tumbling stream as it entered a gorge like section. Not a place to slip on the wet, greasy vegetation. Picking up the main deer trail at the corner of a plantation I was amazed at how much the deer had mashed up the ground. They had created a wide track of deep gloopy mud which was almost impossible to walk along. I slithered about cursing whilst trying to reach the edge of a steep drop and what looked like dry ground. 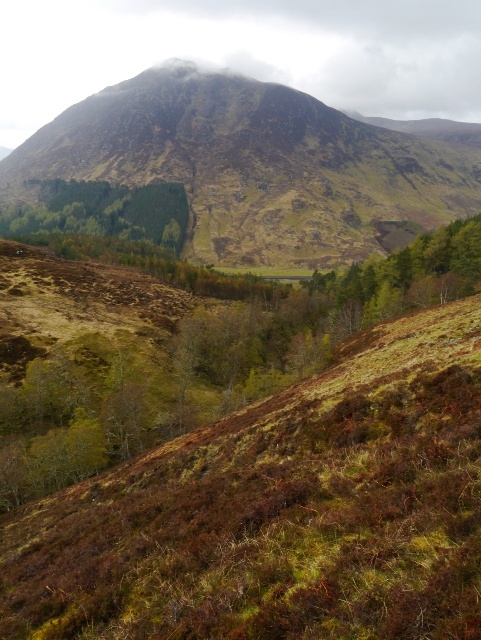 I was pleased to find that it was actually a long abandoned track and I made my way down with ease into the main glen. We were soon back at the bridge, which Reuben crossed this time without as much hesitation. 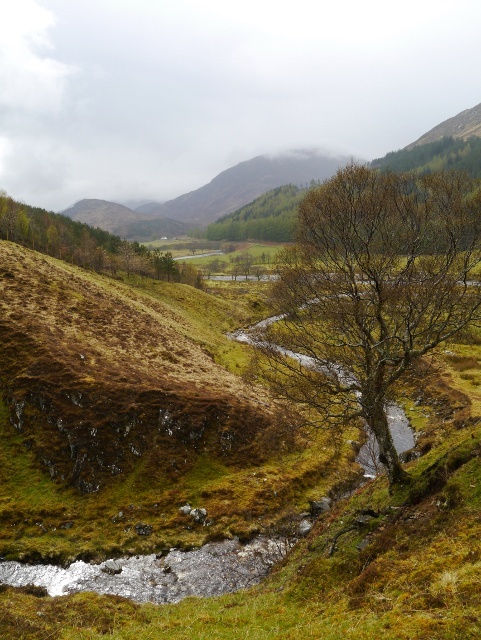 I drove the few miles back to our cottage at the head of the glen. Corrina confirmed that it had been bright there for most of the day, the hills largely free of cloud. It just goes to show how localised the weather can be in the Highlands. 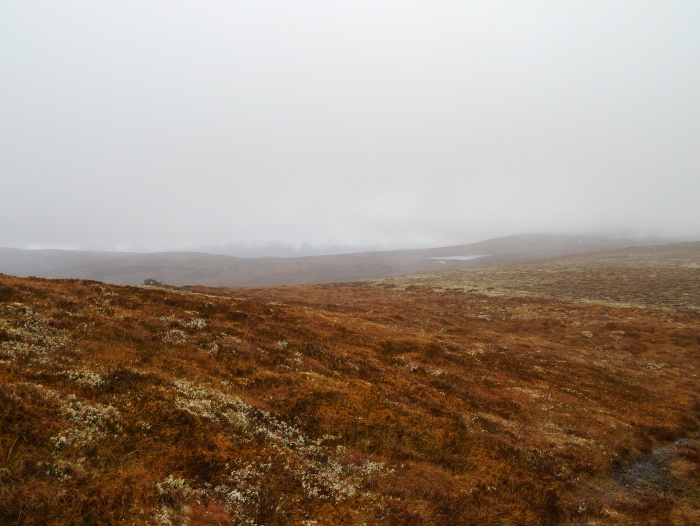 A shame that the last day in lovely Strathconon had been spent battling across a peat hagged landscape covered in mist! A few months ago I wrote of my plans to hike the Arctic Circle trail in Greenland. I have to say that I wish that I had done my research on travelling there before mentioning my intentions. The cost of the flights are prohibitively expensive and difficult to justify for a trekking holiday. I also have to admit that I started to get the heebie-jeebies about walking solo for 10 days across the arctic tundra. 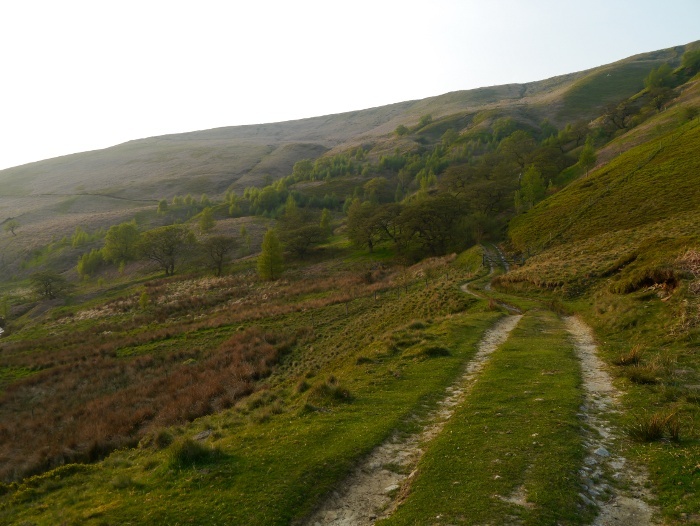 Only around 300 people complete the trail each year and you really are on your own out there from start to finish………. I then started to research other routes which would still take me above the arctic circle, but be cheaper and less daunting. 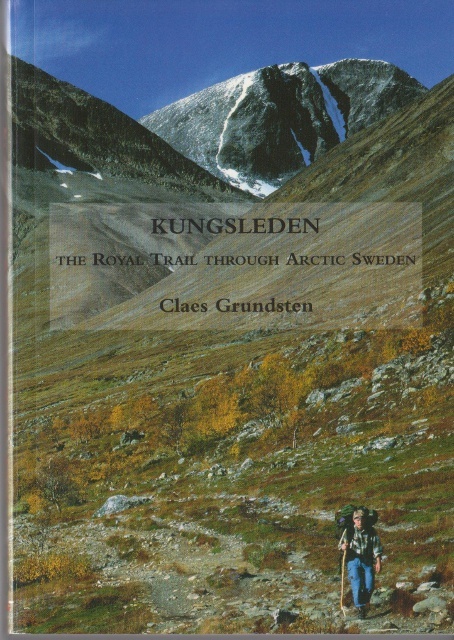 I finally settled on the Kungsleden in Sweden. As much as I would love to do the full 440 kilometres, I only have a weeks holiday available this year. I have settled for the northern section, a total of 105 to 121 kilometres in seven days. I plan to start in Abisko and finish in Nikkaluokta, both accessible from the city of Kiruna. I have to say that for a popular trail it has been difficult doing research on the practicalities as there is not a huge amount written in English. The guidebook is excellent for the trail itself but gives no indication of how to get to the various trailheads. Gathering information from various sources I worked out travel arrangements and today took the plunge and booked my tickets. I fly to Stockholm where I will spend the night. 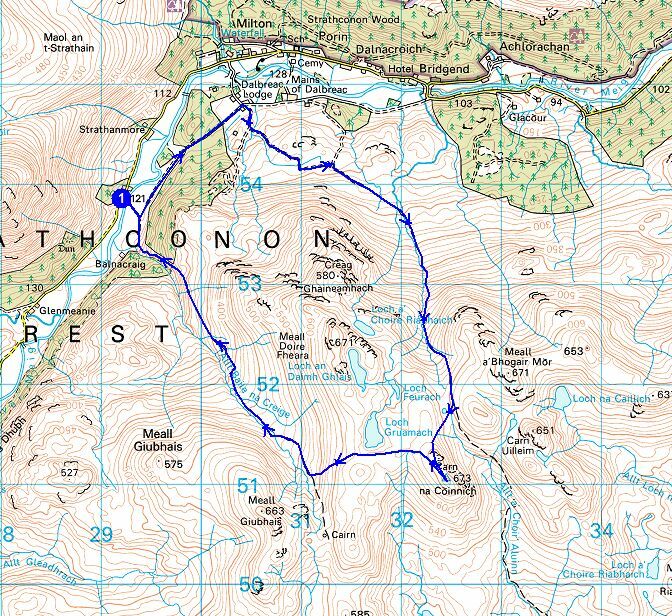 The following evening I have booked a sleeper train, a 17 hour journey which will drop me off right at the trail head. I have treated myself to a private cabin, which although not cheap is better value than the sleeper to Scotland. The journey home is much quicker with a flight from Kiruna to Stockholm, a short wait and then onwards to Manchester. The lake in the side valley opposite the huts can be a pleasant excursion. The stream from the lake forms attractive waterfalls, as it drops towards the main valley. The lake itself is a hidden pearl, set in a beautiful hollow surrounded by high peaks. 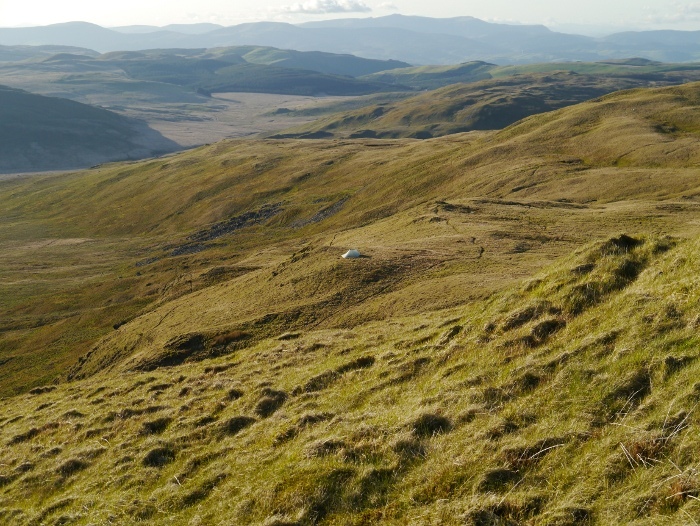 If you wish to spend the night in solitude, it is worth finding a tent pitch in this unforgettable landscape. Sold! 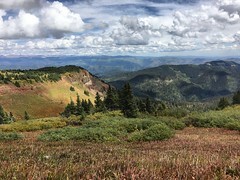 There are also several peaks that sound like they could make worthy side trips from the main trail if energy and enthusiasm is high. The only downside of this section of the Kungsleden is its popularity. Hopefully starting in mid August I should avoid the main peak season and I will be going after the school holidays. The mosquitos may still be a problem though. Anyway, enough waffling as the trip is still 3 months away. A couple of questions for you. Has anyone stayed in Stockholm? I am looking for a cheap and half decent hotel which is within walking distance of the train station. Less than £50 for a single room and I will be a very happy man. Also suggestions for what to do for a day whilst I wait for the train? Here is the best video that I could find of the Kungsleden, with the exception of the music it really makes me want to be there now. 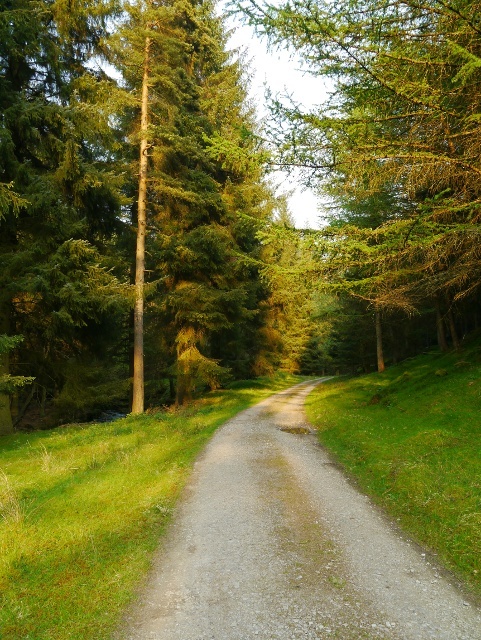 It is also the section of the trail that I am going to do but in reverse.